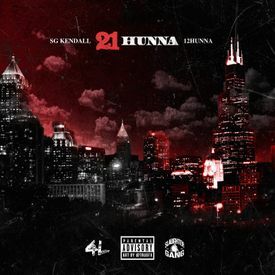 Here to make their collective presence known on the Lyrical Lemonade pages today, two artists by the names of SG Kendall and producer 12Hunna just linked up for their brand new collaborative effort, 21Hunna. With this one, the Atlanta rapper pulls out all the stops, showcasing his rapping, singing and song-making ability with every song over a bed of knocking production from Hunna. Kendall’s natural abilities as a songwriter and musician motivated him to use the pain caused by his traumatic past to create something positive, and the result, of course, is the budding talent’s uncanny ability to foster honesty in his art — a prominent theme of his music which is reflected on every record and project that he’s a part of. That said, this new collaborative project reflects past traumas and situations that have molded Kendall into the man he is today, and while it’s his first release since sharing his six-track EP, Count To 6, last year, it’s safe to say that SG Kendall is back, and he’s back with a vengeance. Listen to the new project from SG Kendall and 12Hunna below and make sure to leave your thoughts on the joint project in the comment section!